At the start of November I hurtled up the motorway to ProDrives test track to attend a Shell V-Power Nitro+ event to delve a bit deeper into the tech behind the fuel. I learnt a lot about how car engines work, and how Shell formulate their fuels to compliment this. After a bit of whizzing round the race track in a Jag, pretending I was in the Sweeney, I headed off home with some fuel vouchers to give the fuel a proper road test. This was a fairly big deal, because I know from speaking to pretty senior scientists at Shell, that they don’t get free fuel or even a discount but chose to fill up at the Shell pump because they believe in what they’re doing. We are a fairly low mileage household, so what was originally envisioned as being a months worth of fuel quickly turned into two but we’re there now- the vouchers (which caused some little consternation in our two local Shell filling stations, as various staff never quite worked out how to process them properly and had to keep disappearing out the back to make hurried telephone calls) have run dry. It’s been an interesting couple of months. I would have liked more cold weather, just to test the properties a bit more in a variety of different weather conditions but overall I’ve had a pretty good run. 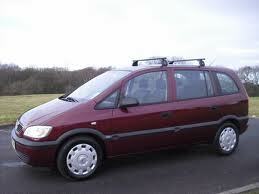 Our main family car is a 1.6l petrol 53 plate Vauxhall Zafira. It’s 10 years old now but only has 75,000 on the clock and is of a sufficient trim level to have stuff like the engine management systems that occasionally scares the life out of me. It also drinks oil like no car I’ve ever driven- about a litre every 4 months. Contrast that to the car it replaced- a Toyota RAV4, that didn’t even discolour the oil between services, let alone appeared to have used any- and it looked like an interesting experiment to try out a premium fuel with the Zafira. Over the course of it’s life our maroon Zafira has been mostly run on supermarket fuels. That makes sense in a way because it’s a family car and we spend a lot of time in supermarkets, most of which have a petrol station attached to them. However over the years I’ve been involved with Shell and their Network of Champions, I have come to realise that everything that comes out of a refinery isn’t the same, and it’s not all down to how much any given company spends on advertising. Fuel science does make a difference, so it has been interesting to see what a difference a couple of months of Shell V+ Nitro + has made to our family run about. Admittedly, when you talk about premium/high octane fuels, most people assume you’re putting it in something flashy- at least a Porsche, hopefully something better like a Ferrari and I have had a few raised eyebrows when people find out I’m putting it in a people carrier, and a ten year old one at that. On the other hand, there are certain features that the fuel has that are very useful to older vehicles. The lubricating aspect of the fuel is important as we do a lot of short journeys (with three small kids, the youngest of whom is only just two, sometimes we drive when it’s a mile or two). Shell refer to it as Friction Modification Technology, actually lubricating the parts that the engine lubricant itself doesn’t reach, so in theory, this should help the wear and tear, especially on a cold engine doing lots of short trips. The other important apsect of Shell V Power Nitro + in out car is the powerful detergents. It’s a well know fact that the manufacturer advised maximum BHP slowly declines over the life of the car. One of the key factors in this degradation are deposits from the fuel gumming up the inner workings of the engine. You can read a bit more of the science here or here if you’re interested, it’s something I’ve written about before at some length. Anecdotally the lady wife has commented the odd tank or two of Shell V Power now and then has made her car feel smoother but we’ve never tried to quantify the difference in terms of fuel consumption. So it was with notepad and pen at the start of November I started noted down mileage and details when I filled up the car (a career with a trowel as a field archaeologist means wifey finds it a bit tricky to operate the pumps at petrol stations, so I often fill the car up for her. It’s easier without the kids onboard too). According to the onboard computer, the average fuel consumption of the car over it’s lifetime has been 35 miles per galleon. By keeping my till receipts and doing a bit of basic maths, this has slowly been creeping up over the last couple of months until we’re up to the mid 39.somethings at the moment. It’s mostly local trips, with a few longer journeys into and out of central London or Cambridge. On the motorways I can really feel the lack of a 6th gear and that generally probably doesn’t help the fuel consumption overall. So my figures show an overall increase of 4MPG in the months we’ve been using the V Power Nitro +. This isn’t exactly earth-shattering in absolute numbers, but in terms of a percentage increase, it’s over 10%. Bearing in mind that the car did around half it’s mileage as a motorbility vehicle owned by an elderly gent who used to be a mechanic, it probably never went much over 50 miles an hour in the first half of it’s life anyway. In addition to the actual numbers, we have both felt the car drive more smoothly as a result of the switch in fuel. It no longer does the vehicular impression of a smokers coughing fit when you turn it on either, which is nice, especially when it’s pouring with rain and you’ve just strapped three kids in and are in a hurry to get somewhere. So all in all, we’ve been pleasantly surprised by the very real difference we’ve felt. Considering the price difference between Shell V Power Nitro+ and supermarket fuels, a few pence a litre or a couple of pounds a tank, it seems like a no brainer in my book. Especially since our local Shell station now has a nice gent who fills your car for you while you stay in the dry.